Requirement: Export SharePoint List items to a CSV file. This script exports SharePoint list to csv using PowerShell. It retrieves all list items, Filters it based on the provided column value and then creates a property to hold the list item values and then appends the objects which holds the list item values to an array. Finally, using the Export-CSV Cmdlet, we are exporting the data to CSV file. $web = Get-SPWeb -identity "http://sharepoint.crescent.com/sites/Operations/"
#Get All List items where Status is "In Progress"
Write-host -f Green "List '$ListName' Exported to $($OutputFile) for site $($SiteURL)"
and this script exports all items in the UIL to CSV format. 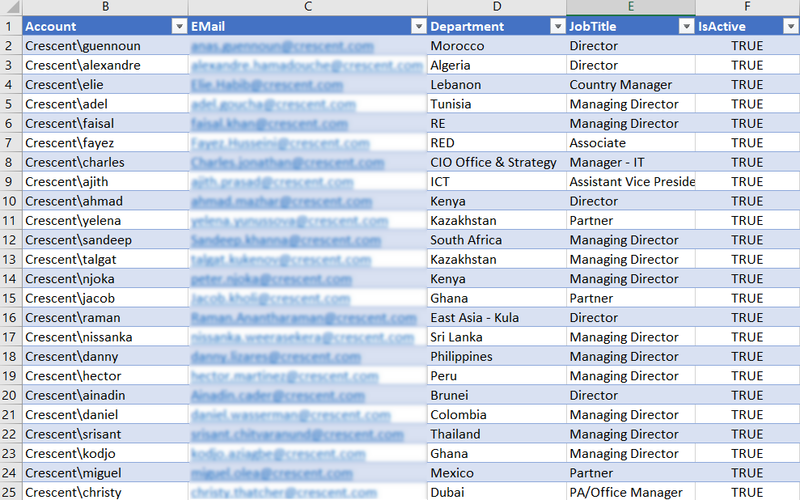 Here is the screenshot of the CSV file generated in Excel. I like your script. What if I just want to export a specific view instead of all the list items? I'm pretty sure it's just a minor tweak to the code but I couldn't figure it out. Thanks. hi boss, your code work great! i also want to show only the specific view. but, it still showing all of the view. this is my code, i'm right? if i want to make it same with specific view, i need to rearrange the exportitem align. What i want is, if i change at view (the arrangement of column) without need to change hardcode, so it will change it according to the view. But it's not showing. Your Script is really Great and very useful for beginners also . Am new to Sharepoint . We are using sharepoint Foundation (2010)Server-1 and Server-2. I have a scenario. I need to export a filtered items in a list from one server and moved it to another server. After moved the items to 2nd server, the particular items will be removed from 1st server. In 1st Server My list name is TestList and have a lot of fields one of while is Stage. When field Stage ="Archive" it must be moved to 2nd server which is having a same list template with name "ArchiveTestList". After moving it the particular rows will be removed from 1st server List. When you say: 1st Server and 2nd server, Are they different SharePoint environments? If so, You can write a PowerShell script to do copy-move operations. However, This script would be either scheduled basis or On-demand, But not on list data update event! Many Thanks for your response. I achieve it through the Powershell Script. But when i try to run it via batch file and invoke the Administrator: Sharepoint 2010 management shell and through that when i run myscript.ps1 it worked fine on Manually running the batch file. But when i try to execute my batch file through vb.net code it shows the following error in powershell : "The term 'Get-SPWeb' is not recognized as the name of a cmdlet,function,script file, or operable program ". Am also added "Add-PSSnapin Microsoft.SharePoint.PowerShell -ErrorAction SilentlyContinue" in my script. How to resolve it. Help me. Great script! Thank you for sharing this. How do I modify this to only export a specific Date? Nice PoweShell script, it is really very helpful for exporting all items from Sharepoint list to csv files format. I tried the following above script to export SharePoint list data into CSV files and I also found good application (http://www.lepide.com/sharepoint-audit/) which enables to automate export reports and get real time alerts on detecting changes to servers, farms, content, groups, users, permissions, sites, lists, libraries, files/folders, etc. I m trying to use for a view in a list. i dont need any status . it worked but the script is not pulling whole items . That's because of Excel's column formatting! "Get-SPWeb : The term 'Get-SPWeb' is not recognized as the name of a cmdlet, function, script file, or operable program. Check the spelling of the name, or if a path was included, verify that the path is correct and try again." run this below code before executing/calling the sharepoint script. Love you script! I do have a question. Is there a way when export dates to exclude the time (my output has [date, 0:00])? Also, some of my fields which have names it exports and id number and #. (ex: 755#,John Smith). Is there a way to exclude that info? I want to export pages library data, What if we have data inside folders. I want to export each folder data to separate csv file. Your code is awesome, I have folder hierarchy in Document Library, So When I execute the code it is not exporting data inside folders. How can I achieve this please help me. Thanks:) Rajak, Great work. You killed my frustration. Question, how would I change it so I'm able to export different types of columns such as dates, a text field or a user filed otherwise its throwing an error. Based on the column type, You have to retrieve its value differently. E.g. For column type like People Picker and Lookup. Search this blog for such scripts! When my sharepoint list items are blank. CSV is coming without header. Can we pull the list items with headers even if the list items are blank. How do i get the complete urls of all the items in the same script. I want the item url and not the id or title. i would want to export all list items with the data to CSV file. i Ran your script which you posted "Export All fields in the list to Excel using PowerShell"
but it is giving empty file. could you please help me to export all list items with the data to CSV file. i would want to export all items with the data to CSV file. i ran your script which you posted " Export All fields in the list to Excel using PowerShell"
but i got the empty csv file. kindly help me. is there anything else do i need to change..?